There has been a rash of posts in help forums by people reporting their computer is infected with the Blaster Worm, w32blaster/worm. It is not the Blaster Worm that has infected these computers but rather a fake/rogue antispyware program called "Spyware Protection". Note: If you are unable to connect to the Internet, it will be necessary to go to an uninfected computer and download both RKill and Malwarebytes and transport the files to the infected computer via CD/DVD or memory stick. A command window will open then disappear upon completion, this is normal. Please leave RKkill on the Desktop until otherwise advised. Do NOT restart your computer after running rkill as the malware program(s) will start again. Note: If you you receive security warnings about RKill, please ignore and allow the download to continue. 3. Please download Malwarebytes' Anti-Malware to your desktop. Once the program has loaded, be sure Quick scan is selected, then click Scan. After completing the above steps, take the additional time to update the third-party software on your computer, particularly Adobe products and Java. Also, double-check that any old, vulnerable versions of Java have been uninstalled. If you are still having problems with your computer after completing the above instructions, assistance is available from trained analysts trained in malware removal at the sites listed in Malware Removal Help Sites. As each site has different requirements, please follow the instructions provided at the site. Online shopping is no longer reserved for Cyber Monday, the Monday after Thanksgiving when most Americans return to work after the long Thanksgiving Holiday weekend. However, during the Holidays, online shopping does increase. Along with the increased shopping, there is also increased opportunities for scams, phishing, and identity theft. If the deal sounds too good to be true, most likely there are hidden strings, such as high shipping costs. Before you start shopping, take care of basic security. This includes having a software firewall and up-to-date antivirus and anti-malware software. Now run a full system scan with your updated antivirus software. Next, scan with an anti-malware software. If you do not have an anti-malware software, my favorite is Malwarebytes' Anti-Malware. Another popular program is SUPER AntiSpyware. Check for and install Security Updates, including third-party software such as Adobe Flash and Java. Be sure you are using an updated browser. Each version release includes security updates. Your computer is ready and so are you. But, safety precautions do not end with your computer. Now the onus is on you to protect your credit. Shop at reputable websites. If the offer sounds too good to be true, it is probably a scam. Customer evaluations are available at sites like Epinions.com or BizRate to help you determine the legitimacy of a company. ONLY do your online shopping from home and never from an insecure public WiFi spot or public area like an Internet cafe. To complete your purchases, checking out will require creating an account. It is not advisable to store your credit card and other personal information on the website. At checkout, the site web address should be https: and there should be a closed padlock there or in the lower right corner of your browser. If not, forget about it. You will be giving away your credit card information! It is best to use a "true" credit card, rather than a debit card as it is better fraud protection. At the completion of your order, print or make a screen copy, including the confirmation number, as a receipt for your purchase. Finally, a couple of money-saving tips that may result in additional savings when you shop online. "Hundreds of well-known online stores like Barnes and Noble, Staples, and Overstock.com have a place within their shopping cart for a "coupon code" that gives a percent or dollar amount off your purchase. If you don't know the code, you can't take advantage of the discount. You can find these secret discount codes and coupon codes listed on many sites across the internet but the problem with these sites is that they're usually personal homepages and they don't maintain their lists! Currentcodes.com has a full-time staff of trained individuals whose only job is to find new coupon codes and discount codes and verify the accuracy of the existing database. We don't flood you with ads and we don't throw deals in your face. No hype, just current codes." Check CyberMonday.com which includes special offers, including free shipping, at hundreds of online merchants. On the actual Cyber Monday, the site will provide hourly specials and exclusives from popular online retailers. A portion of the proceeds from CyberMonday.com supports the Ray Greenly Scholarship Fund. RetailMeNot.com has printable coupons as well as coupon codes for online shopping. It is definitely worth checking. 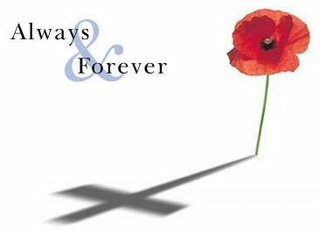 At the the 11th hour of the 11th day of the 11th month, set aside politics and petty grievances and take time to pay tribute to all who died for their country. As it happens, the 11th hour this year will occur on 11/11/11. "I too "will remember your friends who never had a full life", while thanking you and your comrades who have served with pride, honesty and honour. Despite anyone's thoughts of the current conflict in Iraq - opposition or agreement, we must always remember that these brave young men and women are fighting for a cause they also may or may not agree with. The huge difference between them and us is that they are putting their lives on the line 24/7 while we sit in our homes in comfort, using the freedom of speech previous warriors won for us, and for that they deserve our love, respect, and support." Oh! you who sleep in Flanders Fields, Sleep sweet - to rise anew! We caught the torch you threw And holding high, we keep the Faith With All who died. We cherish, too, the poppy red That grows on fields where valor led; It seems to signal to the skies That blood of heroes never dies, But lends a lustre to the red Of the flower that blooms above the dead In Flanders Fields. And now the Torch and Poppy Red We wear in honor of our dead. Fear not that ye have died for naught; We'll teach the lesson that ye wrought In Flanders Fields. Microsoft released Security Advisory 2641690 which relates to the revocation of trust in an Intermediate Certificate Authority, DigiCert Sdn. Bhd. (Digicert Malaysia). The subordinate CA issued 22 certificates with weak 512 bit keys. The subordinate CA has also issued certificates without the appropriate usage extensions or revocation information. to a Windows kernel issue related to the Duqu malware, a trojan that injects malicious code into other processes. If you do not have automatic updating enabled, the update is available by checking for updates or can be downloaded from KB Article 2641690. A critical update was released today by Adobe for Adobe Flash Player and Adobe AIR. The update was released to address critical security issues in which all except one of the CVE's relate to vulnerabilities that could result in code execution. The remaining vulnerability could lead to a cross-domain policy bypass for Internet Explorer users. The latest version for Adobe Flash Player for Android is 11.1.102.59. It is available by downloading it from the Android Marketplace by browsing to it on a mobile phone. The newest version of Flash Player for Windows, Macintosh, Linux and Solaris is 11.1.102.55. If you use the Adobe Flash Player Download Center, be careful to UNCHECK the box shown below. It is not needed for the Flash Player update. In addition, any toolbar offered with Adobe products can be unchecked if not wanted. As expected when a version update is released, you may find that many of your favorite add-ons are not compatible with the new release. Use Add-on Compatibility Reporter to test and report on your favorite add-ons in version 8. The following security updates are included in the release of Firefox 8, in which MFSA 2011-48, MFSA 2011-49 and MFSA 2011-52 are rated Critical, with the other three updates rated High. The upgrade to Firefox 8 will be offered through the browser update mechanism. However, as the upgrade includes critical security updates, it is recommended that the update be applied as soon as possible. To get the update now, select Help, About Firefox, Check for Updates. Microsoft released four (4) bulletins addressing vulnerabilities in Microsoft Windows. One bulletin is rated Critical, two Important and one Moderate. The Critical update, MS11-083, Vulnerability in TCP/IP Could Allow Remote Code Execution (2588516), requires a restart. Three three threat families are included in the November edition of the Microsoft Malicious Software Removal Tool - Win32/Carberp, Win32/Cridex and Win32/Dofoil. Additional information about Win32/Carberp is available in MSRT November '11: Carberp. An update to Adobe Shockwave Player has been released to address critical vulnerabilities in version 11.6.1.629 and earlier version on both Windows and Macintosh systems. 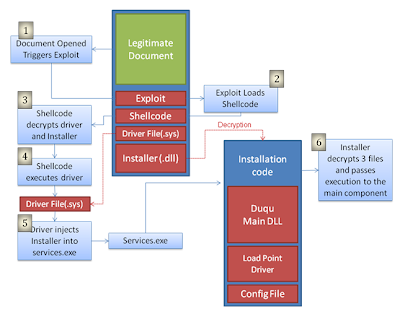 If successfully exploited, malicious code could be executed on the system. The newest version of Shockwave Player 11.6.3.633 is available here: http://get.adobe.com/shockwave/. Please remember to uncheck any unwanted 3rd party toolbars/programs during installation. Also please do not confuse this with Adobe Flash Player which is a different program. Microsoft released Security Advisory 2639658 which relates to a Windows kernel issue related to the Duqu malware, a trojan that injects malicious code into other processes. 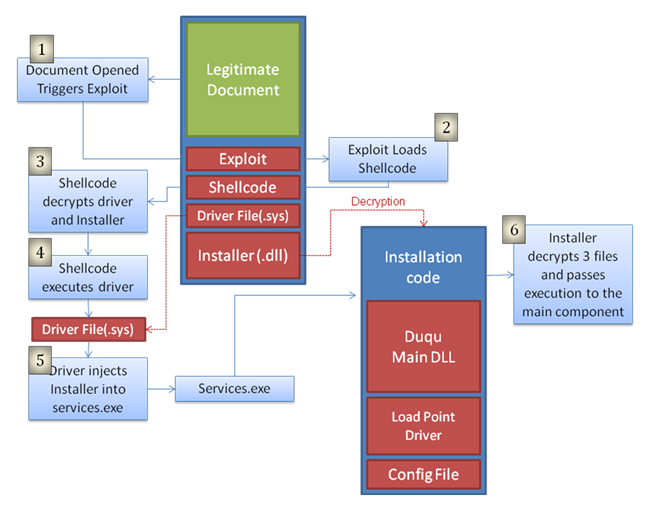 As illustrated in the image below of the Duqu infection schematics, provided by Symantec in Duqu: Status Updates Including Installer with Zero-Day Exploit Found, once infected, the trojan can then install programs; view, change, or delete data; or create new accounts with full user rights. Microsoft is aware of targeted attacks that try to use the reported vulnerability and reports that at this time they see "low customer impact". Work continues to provide a security update for the vulnerability, either via an out-of-band update or during the regular monthly release process. An update is not expected to be ready for delivery with the scheduled November update. As an interim work-around, Microsoft has provided a Microsoft Fix it solution to simplify the work-around for workaround to deny access to t2embed.dll. The Fix it solution is available from Microsoft KB Article 2639658, with direct links to the download files to enable and disable the solution below. On Tuesday, November 8, 2011, Microsoft is planning to release four (4) Security Bulletins, addressing four (4) CVEs in Windows. One bulletin is identified as Critical, two as Important and one Moderate. The bulletins address Remote Code Execution, Elevation of Privilege and Denial of Service, several requiring a restart. Whether required or not, it is advised to restart your computer after installing updates.